During the UID talks the interactive Installation DiffractMe is shown at the Art Campus. DiffractMe is the first module of a bigger installation designed within a research collaboration between the Umeå Institute of Design, Interactive Institute Swedish ICT and the Department of Industrial Design of the Eindhoven University of Technology (the Netherlands). DiffractMe has been designed by Stoffel Kuenen, Jeroen Peeters, Ambra Trotto and Philémonne Jaasma with the creative and technical support of Interactive Institute Umeå and the UID workshop. DiffractMe is located in the spaces of the Art Campus’ cafeteria on May 30th and 31st 2013, available for people to play with. DiffractMe builds a shimmering, engaging and poetic space, through sculpting light and working with its chromatic properties. Spaces are absence; a constructed absence in which people can move about, perceive, experience and therefore conceive. DiffractMe engages visitors in playing with this dynamic vacuum, existing between people’s bodies and the palpability of the installation: the interaction surface and the prisms’ facade. Visitors engage and play with the qualities of the dynamic absence in the space, which the installation creates. This reaches beyond its physical boundaries, involving spectators in their personal creation of a new horizon of meaning. 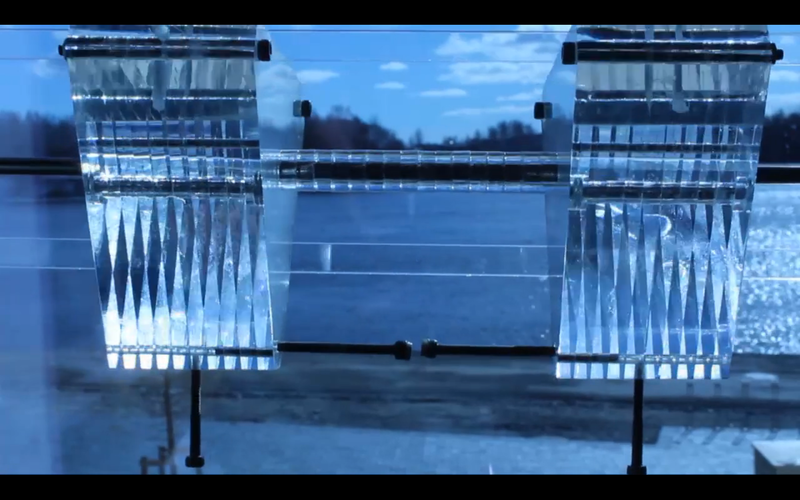 A large frame houses a matrix of transparent prisms, mounted on horizontal axis. Each prism can move independently, rocking on its axis. Sunlight is diffracted and reflected by the prisms, projecting a shimmering pattern onto and into the environment. Visitors control a row of trigger prisms by manipulating a surface with their hands. All of the prisms are interconnected through small magnets, allowing the movement to transfer from one prism and be slowly but surely distributed to all the others in a ripple-like, resonating effect. Spectators are immersed in a shimmering, responsive space of coloured light. As they come closer, they are enticed to engage with the installation. By placing their hand on mobile surfaces and rocking them back and forth, they create a subtle, resonant effect that moves through the lighting pattern. This has a directly perceived, and profound, effect on the surrounding environment. As they interact with the installation, they tactually and visually perceive others doing the same. This joint empowerment creates a mysterious, irresistible intimacy between participants. The result is a synergic composition in light and tactile feedback created by those engaged.